What are microgreens and baby greens? Micro- and baby greens are tiny, tender, flavorful seedlings of vegetables and/or herbs. Microgreens may be harvested for their youngest leaves, while baby greens are harvested at 2″–4″. Both pack a big punch when it comes to nutrients. Studies show they can be up to 40 times richer in vital nutrients than the mature plants. Why grow them? Microgreens and baby greens are not just for chef-inspired plates anymore—these nutrient powerhouses can grow right on your windowsill. 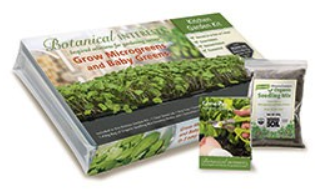 Quick and easy to grow indoors, sow micro- and baby greens in successions for a continuous supply at your fingertips. There is a great selection of seed varieties available that can be grown for microgreens and baby greens. Sample several varieties, including seed blends, from the great selection of Botanical Interests seeds available in our Garden Center. You are sure to find some favorites. We also have Botanical Interests Kitchen Garden Kits available. Once you have your seed selections, this kit has everything you need to grow delicious and nutritious microgreens and baby greens in a reusable growing system. The kit includes: a clear plastic dome, a perforated growing tray, a solid drip tray, two sowings worth of specially formulated Wonder Soil Organic Seedling Mix (which is made from coco fiber, a sustainable alternative to peat), and a detailed instruction booklet with recipes. 1. Place perforated growing tray inside the solid drip tray. 7. Keep indoors on a sunny windowsill or underneath grow lights. Grow lights can be as simple as a shop light with cool white fluorescent bulbs, or a mix of cool-white and warm-white tubes placed 1″–2″ from the top of your plants, and run for 14 to 16 hours per day. • Hand-wash and sanitize the trays and domes between uses. You can also use other seed trays or repurpose containers to grow your microgreens and baby greens. If you are repurposing containers, read the following and then return to step #5 above. Use a shallow container with drainage holes, such as a recycled plastic clamshell container, like those used for berries or cherry tomatoes in the grocery store. First, wash the container in warm soapy water to remove debris and then sanitize in a 1:9 ratio of bleach to water for 30 minutes. When the containers have finished soaking, rinse them in clean water before filling and planting them. Fill your container with 1 to 2 inches of pre-moistened seed starting media. Harvesting: When seedlings emerge, the first leaf or pair of leaves to show are the cotyledons, which can look very different from the leaves that follow, called “true” leaves. 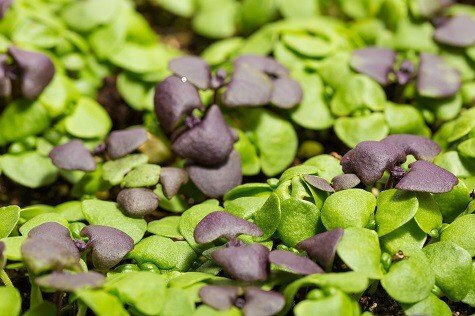 Microgreens are ready to harvest in about 7 to 14 days after sowing, when they have cotyledons, and baby greens are ready in about 20 days, when they have true leaves at 2″–4″. Once cut, microgreens will not re-grow. If some leaves are left intact on baby greens you may see re-growth. Cool growing temperatures (below 65°F) may slow germination and growth. Harvest by cutting just above the soil line. 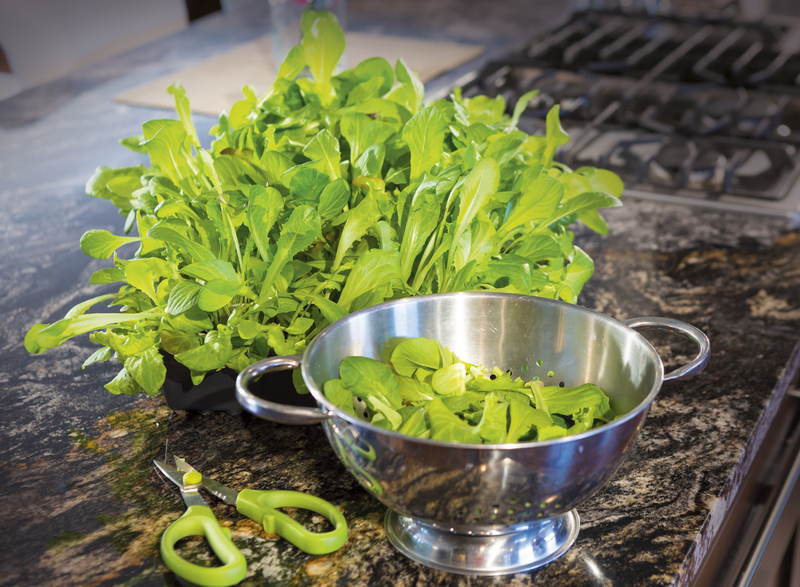 Rinse and use, or store dry micro- and baby greens in the refrigerator in a sealed container. See individual seed packets for more information about growing and using each variety.